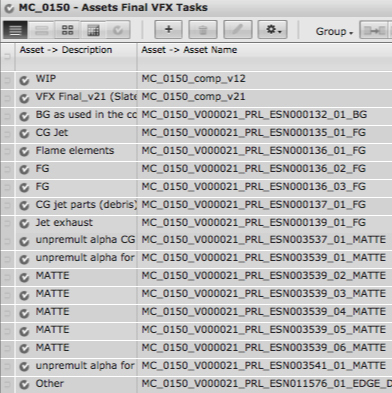 Shotgun has played a vital role at Identity FX on tracking all our 2D to 3D conversion project pipelines. From The Chronicle of Narnia: Voyage of the Dawn Treader, to Green Lantern, we’ve taken full advantage of it to provide a comprehensive and up to date catalog of our projects. During the past six months, Identity provided work for both Green Lantern and Conan the Barbarian, using Shotgun to maintain the upkeep of more than 370 total 3D stereo conversion shots and took full advantage of its robust shot tracking and asset management. A brief look at some of our stereoscopic 3D conversion workflow techniques will highlight Version, Asset, and Note tracking, as well as using Shotgun to provide quick summaries of shots and automate Submission delivery documents. Shotgun provided us with a great way to maintain chronological organization of each version, client note, and asset of every shot. Using Shotgun to create new versions for each submission, we were able to monitor and backtrack through older versions referencing script name and dates generated through the software. Versions approved for client submission were then filtered through a series of constraints in Shotgun’s queue based on pipeline and status, where they were then easily accessible via custom pages within our existing project. See below for Submission Delivery example. Notes also played a vital role in the upkeep of our projects. These included both client feedback as well as internal lines of communication to artists. Just as versions were created, notes for each version could be updated and tracked to the dates modified and cross referenced with the original source feedback provided by the clients. 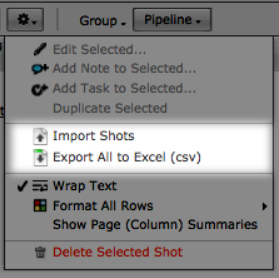 Using Shotgun’s easy to use CSV importing, we were able to batch update as many shots as were delivered all in one keystroke. Both an accurate and efficient process, these notes were open to view on both the Shot and Scene level and assisted in creating progress summaries of all shots. The same principle concept was used for generating easy access to a shot’s assets. As we received newer versions or assets for the various VFX shots on both shows, each new element was created as an asset and linked to its respective shot. Artists then had the ability to access a shot, see what elements were available to use, and work from there or submit additional requests based off these lists. With an overview of what background plates, mattes, or CG elements were present, the upkeep and accessibility of the assets per shot played a vital role in the speed at which artists could work. Displaying this data in a quick and efficient summary was another key factor for Identity’s success in completing both shows. 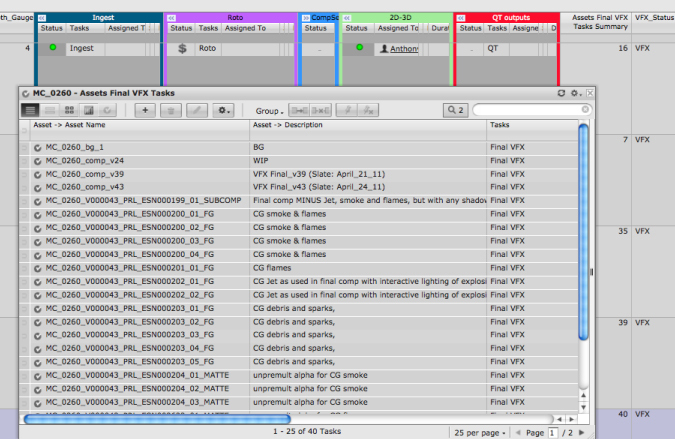 By highlighting key details, a quick overview of each shot was displayed at the Scene level of each show. This included the current pipeline step – everything from ingest to conversion to final delivery – version number, cut summary, and more. Notes and feedback were displayed at this topmost level, and we were even able to link the number of assets per shot to display in a pop-up dialogue window for easy access. As mentioned earlier, with the use of constraints within Shotgun’s queue we were able to create project specific pages that would provide detailed summaries. For example, by creating custom fields and statuses we were able to automate our Submission Documents and minimize the probability of generating human error. 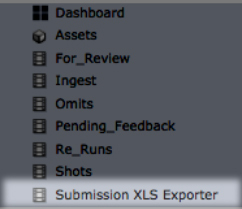 By adding a custom checkbox to indicate which shots had been approved that day for delivery, Shotgun would filter all shots to a page displaying the required information for the submission document. This could then be easily exported to a CSV document, where simple equations were added to produce the specified nomenclature and formatting. With this method we could easily generate submission documents that met our client’s need with minimal chance of error after engineering the pipeline. In conclusion, Shotgun has provided an invaluable service to Identity during the past several projects. The flexibility and customization available provided a means for us to concentrate on delivering the highest quality conversion shots on multiple projects simultaneously, maintaining the high standards Identity FX is known for.